2,5-Dimethoxy-4-methylamphetamine (DOM; known on the street as STP, standing for "Serenity, Tranquility and Peace") is a psychedelic and a substituted amphetamine. It was first synthesized by Alexander Shulgin, and later reported in his book PiHKAL: A Chemical Love Story. DOM is classified as a Schedule I substance in the United States, and is similarly controlled in other parts of the world. Internationally, it is a Schedule I drug under the Convention on Psychotropic Substances. It is generally taken orally. 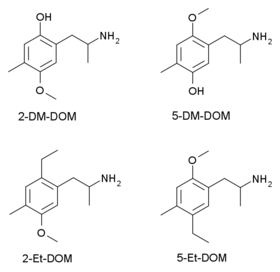 DOM was first synthesized and tested in 1963 by Alexander Shulgin, who was investigating the effect of 4-position substitutions on psychedelic amphetamines. In mid-1967, tablets containing 20 mg (later 10 mg) of DOM were widely distributed in the Haight-Ashbury District of San Francisco under the name of STP. This short-lived appearance of DOM on the black market proved disastrous for several reasons. First, the tablets contained an excessively high dose of the chemical. This, combined with DOM’s slow onset of action (which encouraged some users, familiar with drugs that have quicker onsets, such as LSD, to re-dose) and its remarkably long duration, caused many users to panic and sent some to the emergency room. Second, treatment of such overdoses was complicated by the fact that no one at the time knew that the tablets called STP were, in fact, DOM. Effects of this drug include substantial perceptual changes such as blurred vision, multiple images, vibration of objects, visual alterations, distorted shapes, enhancement of details, slowed passage of time, increased sexual drive and pleasure, and increased contrasts. [medical citation needed] It may cause mystical experiences and changes in consciousness. It may also cause pupillary dilation and a rise in systolic blood pressure. DOM is a selective 5-HT2A, 5-HT2B, and 5-HT2C receptor partial agonist. Its psychedelic effects are mediated by its agonistic properties at the 5-HT2A receptor. Due to its selectivity, DOM is often used in scientific research when studying the 5-HT2 receptor subfamily. DOM is a chiral molecule, and R-(−)-DOM is the more active enantiomer, functioning as a potent agonist of the serotonin 5-HT family of receptors; mainly of the 5-HT2 subtype. The 2,6-dimethoxy positional isomer of DOM, known as Ψ-DOM, is also mentioned in PiHKAL as being active, as is the alpha-ethyl homologue Ariadne. Analogues where the methoxy groups at the 2,5- positions of the aromatic ring have been altered have also been synthesised and tested as part of an effort to identify the binding mode of DOM at the 5-HT2A receptor. Both the 2- and 5- O-desmethyl derivatives 2-DM-DOM and 5-DM-DOM, and the 2- and 5- ethyl analogues 2-Et-DOM and 5-Et-DOM have been tested, but in all cases were significantly less potent than the corresponding methoxy compound, showing the importance of the oxygen lone pairs in 5-HT2A binding. Very little is known about the toxicity of DOM. According to Shulgin, the effects of DOM typically last 14 to 20 hours, though other clinical trials indicate a duration of 7 to 8 hours. Listed as a Schedule 1, as it is an analogue of amphetamine. DOM is Schedule I in the United States. This means it is illegal to manufacture, buy, possess, or distribute (make, trade, own or give) without a DEA license. ^ "Green List: List of Psychotropic Substances Under International Control" (PDF) (23rd ed.). International Narcotics Control Board. August 2003. p. 4. Archived from the original (PDF) on 19 December 2013. Retrieved 22 February 2014. ^ Shulgin, Alexander (1991). Pihkal : a chemical love story. Berkeley, CA: Transform Press. pp. 53–56. ISBN 978-0-9630096-0-9. ^ a b Snyder, Solomon H.; Louis Faillace & Leo Hollister (3 November 1967). "2,5-Dimethoxy-4-methyl-amphetamine (STP): A New Hallucinogenic Drug" (PDF). Science. 158 (3801): 669–670. doi:10.1126/science.158.3801.669. PMID 4860952. ^ Sanders-Bush, E; Burris, KD; Knoth, K (September 1988). "Lysergic acid diethylamide and 2,5-dimethoxy-4-methylamphetamine are partial agonists at serotonin receptors linked to phosphoinositide hydrolysis". The Journal of Pharmacology and Experimental Therapeutics. 246 (3): 924–928. PMID 2843634. ^ Eckler JR, Chang-Fong J, Rabin RA, Smith C, Teitler M, Glennon RA, Winter JC (July 2003). "Behavioral characterization of 2-O-desmethyl and 5-O-desmethyl metabolites of the phenylethylamine hallucinogen DOM". Pharmacology Biochemistry and Behavior. 75 (4): 845–52. doi:10.1016/S0091-3057(03)00159-X. PMID 12957227. ^ Braden, Michael Robert (May 2007). Towards a Biophysical Basis of Hallucinogen Action (Thesis). Purdue University. OCLC 703618147. Retrieved 28 February 2012. ^ "Monographs 22" (PDF). Archived from the original (PDF) on 2011-10-15. Retrieved 2011-06-01. This page was last edited on 17 November 2018, at 23:29 (UTC).